MyBB Community Forums - How do i make it stand like this ? MyBB Community Forums > Community Archive > Archived Forums > Archived Development and Support > MyBB 1.6 > 1.6 General Support > How do i make it stand like this ? Full Version: How do i make it stand like this ? Oh yeah, your right, sorry. Was reading a bit to fast, haha. Yeah, just use the link faviouz gave instead. .
That mistake can be easily made actually, so I put a red bolded notice in my tutorial directing to the other tutorials. Thanks! OH THANKS YOU ALOT MY FRIEND ^^! 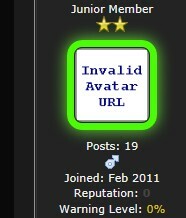 So Can some one please show me how to make Avatar bigger for admin, mod, sm with different size please ?